Atlanta Apostille works with companies and individuals to certified documents for international use. Our team of professionals will help you obtain the appropriate certificates and stamps by reviewing your document for the correct format, attaching the relevant affidavits, completing the proper applications to register your documents with, and submitting your documents to the proper agencies for the fast processing. Our service comes with the promise of dependability and confidentiality. 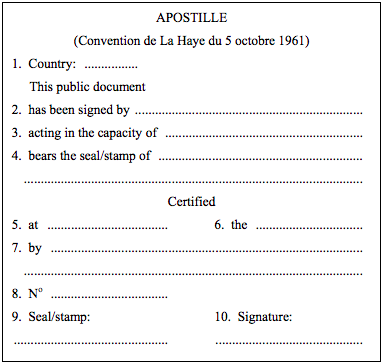 An Apostille is a certificate issued by a “competent” state or federal authority for countries where the Hague Convention Abolishing the Requirement for Legalization of Foreign Public Documents, also known as the Apostille Convention, is enforced. The certificate is attached to an original, or certified copy, of a document. The apostille verifies the seals and signatures of officials on public documents such as vital records (i.e., birth, death and marriage certificates), notarized papers, court orders, or any other document issued by a public authority. The apostille validates that a document can be used in another Hague-member country which has a similar, document verification system. Listed below are the countries that participate in the Hague Apostille Convention with the United States–last official list revised September 18, 2017. The following list of documents show what we can apostille every day. This list is not exhaustive. If you do not see your document on this list, please contact us. If you have any questions, feel free to contact us 24/7 by email or telephone.